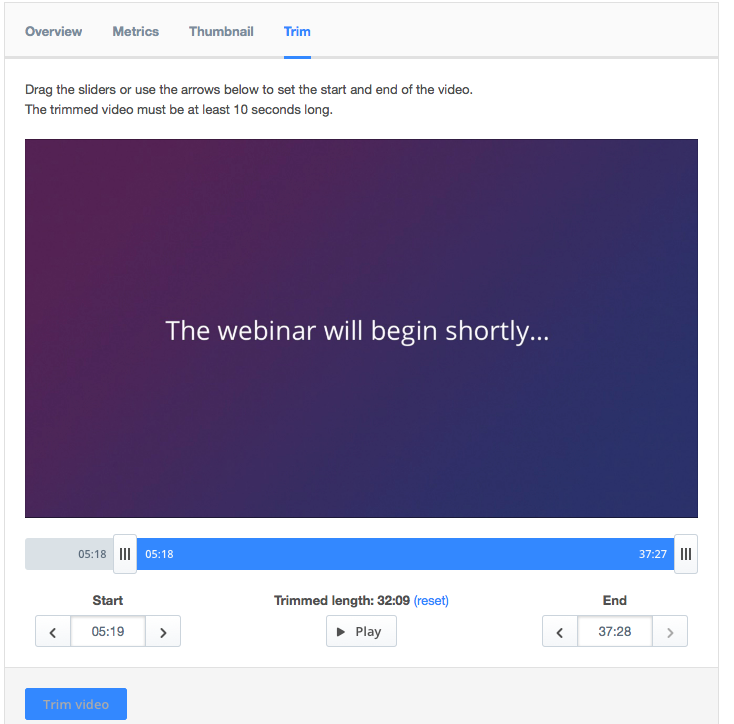 In addition to IBM Watson Media's live streaming capabilities, you can also record your streams and turn them into VOD (video on demand). Pro Broadcasters also have the ability to directly upload recorded videos to their channel. 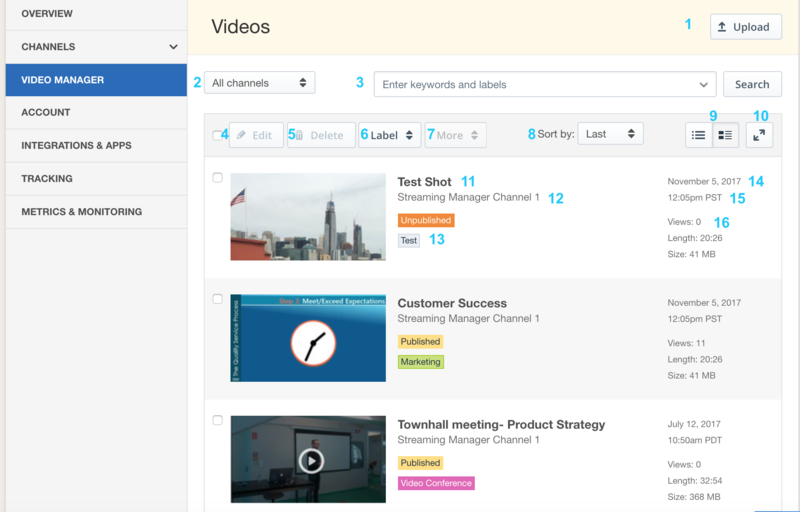 Pro Broadcasting and Video Streaming accounts have additional video management capabilities, allowing you to easily upload, search, review, sort and tag thousands of videos across multiple channels. 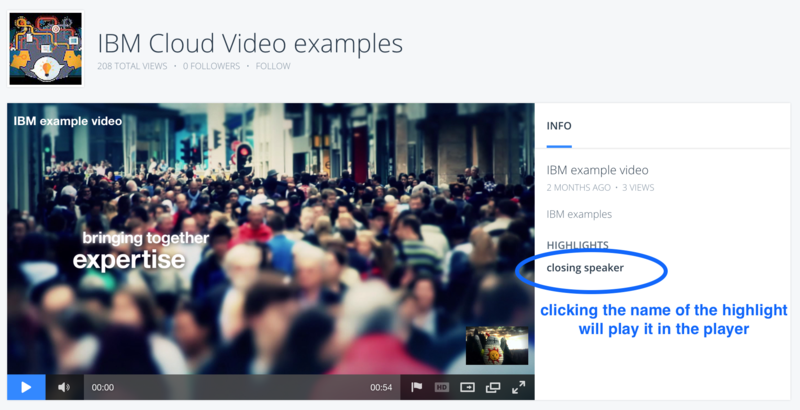 As part of your IBM Watson Media broadcasting dashboard, you will find your video manager. 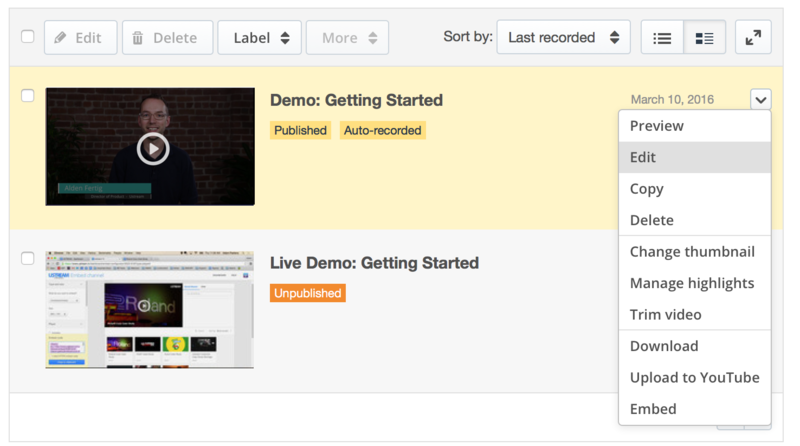 This is where you manage all the videos you have recorded or uploaded on IBM Watson Media. Sort the list by title, length, views, or date recorded. Toggle between compact and thumbnail views. Expand the video management interface. Select any video with the checkbox on the far left, then click the edit button, or click on the drop down arrow at the end of each video row to reveal the available actions for videos. 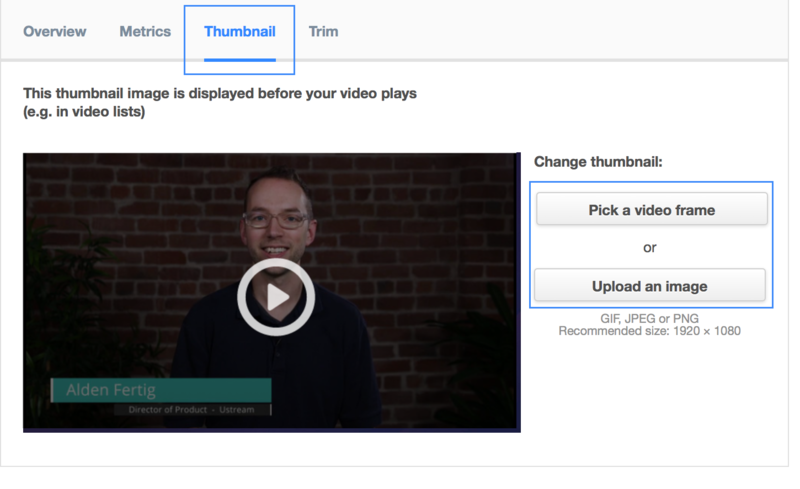 You can use either a still frame from your video, or an uploaded image, to represent your video in thumbnail format in your channel's video gallery. If you choose to upload an image instead of using a still frame from the video, please use a .gif, .jpeg, or .png image format and an image size of 1920x1080. Once on the trim tab, click anywhere inside the blue bar below the player to select an estimated start point. Clicking the pause/play button and clicking forward or back on the blue bar will allow you to select the exact start point you wish for your video. Once you have your in point, double click on the left hand slider to set the in point. Repeat this process with the right hand slider to set the out point for the video as well. 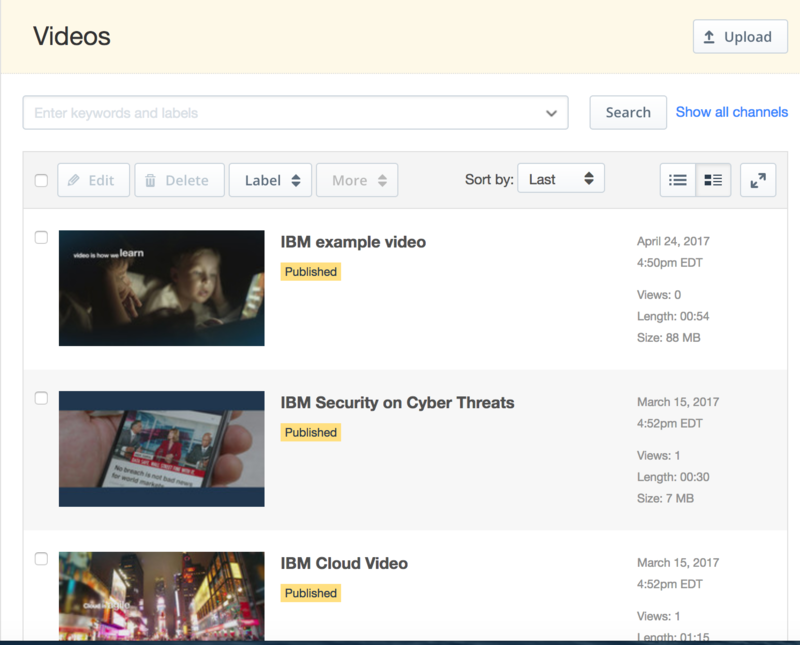 Trim (and Highlight) are functions that only exist inside of the IBM Watson Media platform- when you download your video, or upload the video to Youtube, the full video will play in place of your trimmed video. In addition, your trimmed video will only play on mobile devices if the video has been transcoded to mp4. 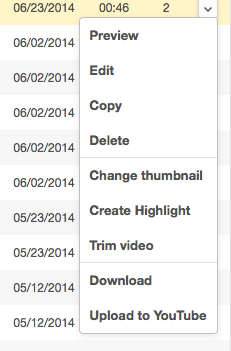 Once a video has been recorded on your channel, you can select discrete sections of the video to create highlights. Note that this is separate from the Trim functionality, as the highlight does not hide the full content of the original video nor does it exist as a discrete element- instead it is available as a 'sub selection' of the original video. To download a video, select the video and choose download from the more menu at the top or the drop down at the end of the video entry row. Pro Broadcasters will automatically have an mp4 version of their video transcoded. 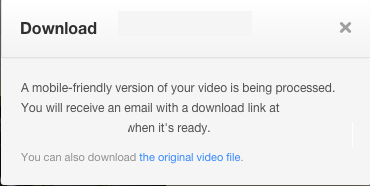 If the video is not yet available, an flv version will be available for download. 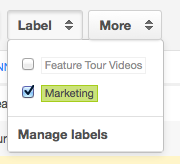 To add or edit labels on videos, select the video and click on the label button. You can apply or remove existing labels, or create new ones. With the video manager, you can copy video files from one channel to another. 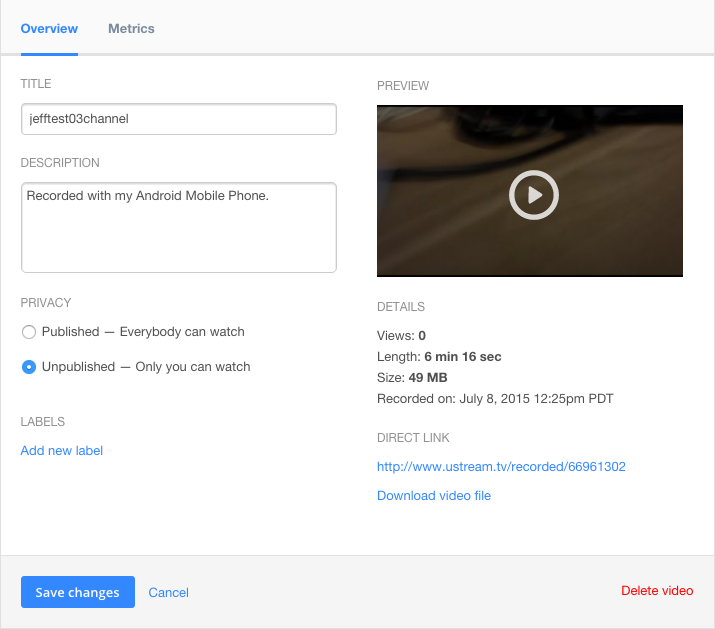 Note: This feature is available at the Enterprise level only, and can be used to move videos between channels on a single account- not between different accounts. To copy a video, select the video and choose copy from the more menu at the top or the drop down at the end of the video entry row. From the pop up window, choose which channel you want to copy the video to. It may take up to a few minutes to copy the video depending on the size of the file. What happened to my videos? How do I password protect my channel and/or videos?